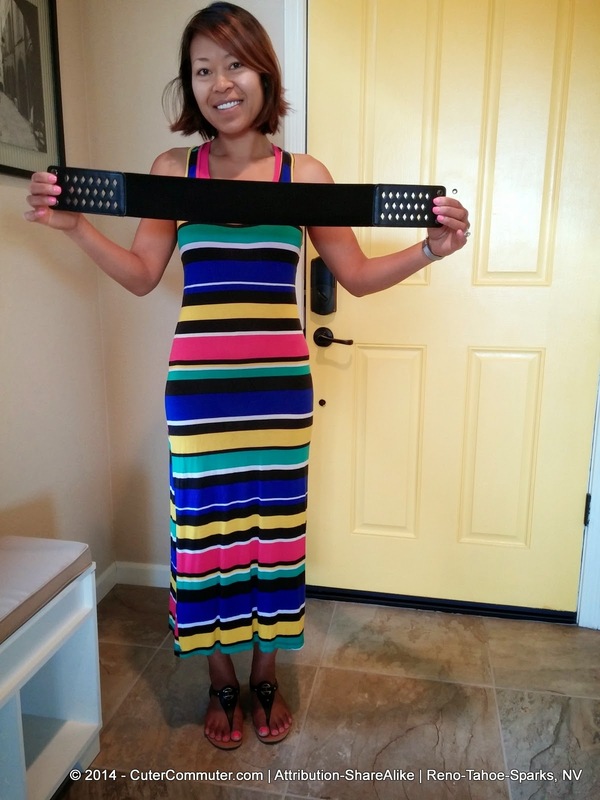 During the summer I love to wear maxi dresses because it is easy to slip on and go. The long length of the fabric protects my legs from the sun and air flows easily underneath so I can stay cool. It is great to wear on especially hot and humid days! Bed hair means no worries about helmet hair. 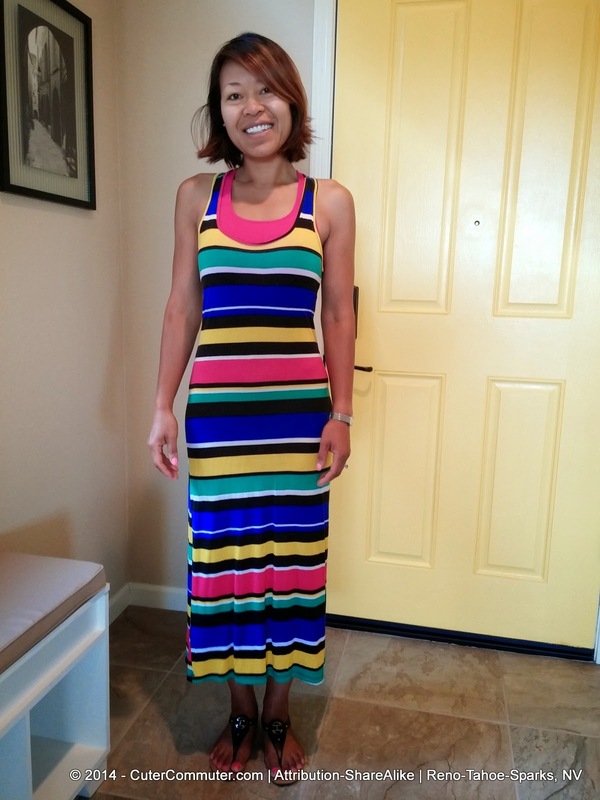 On this particular morning my husband and I were riding our bikes to breakfast BUT I wanted to wear a THIS bright and happy dress!! With it on, I did the long stride step test and I had plenty of room for leg movement. 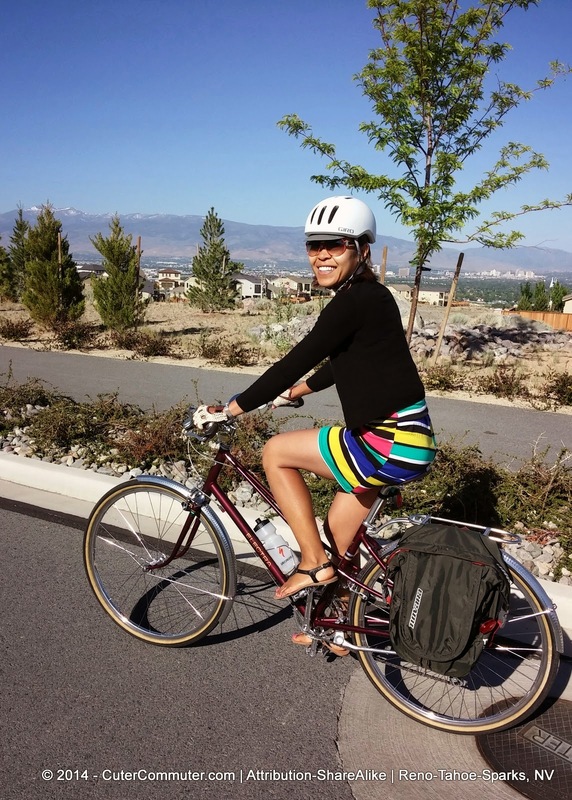 However, I was afraid the length of the dress would hinder me from pedaling in a smooth motion. I could hike up the dress to pedal but knew the extra fabric would fall again once I was standing at a stop light. So I grabbed an elastic waist belt out of the closet (I think any belt would have worked because it will be hidden anyway) and snapped it snugly around my waist. Then I pulled the fabric at the waist up and over the belt until the bottom of the skirt was at the length I desired. 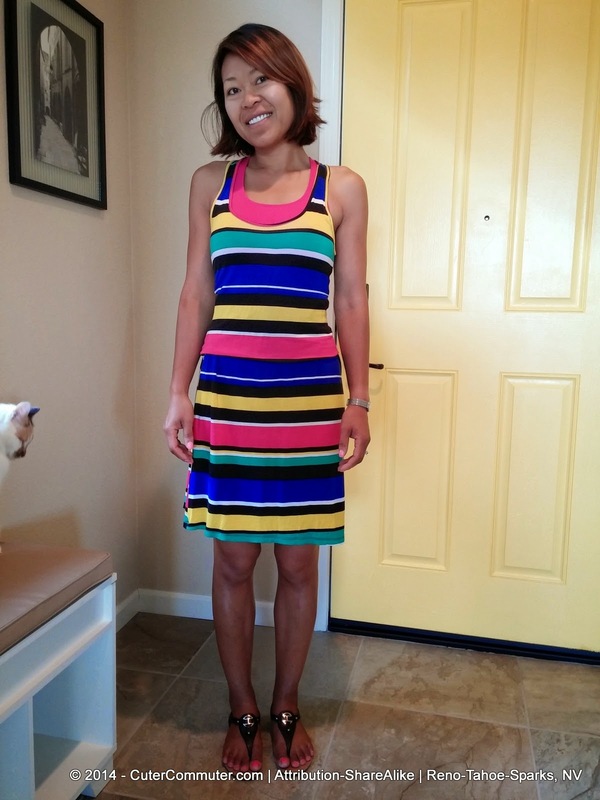 Now I have a shorter dress that I can easily pedal in! BREAKFAST HERE I COME!! It was somewhat cool yesterday morning and I knew it would be even colder going downhill for the first mile of our ride so I threw a cardigan over my dress. When it got warm, I slipped off the cardigan and tucked it away in my pannier bag. After we arrived at our destination, I threw on a wide wire brim sun hat over my head, unsnapped my belt and VIOLA--I was in my maxi dress once more! I think I surprised a few people sitting at the restaurant tables after I did the presto chango in front of them LOL. 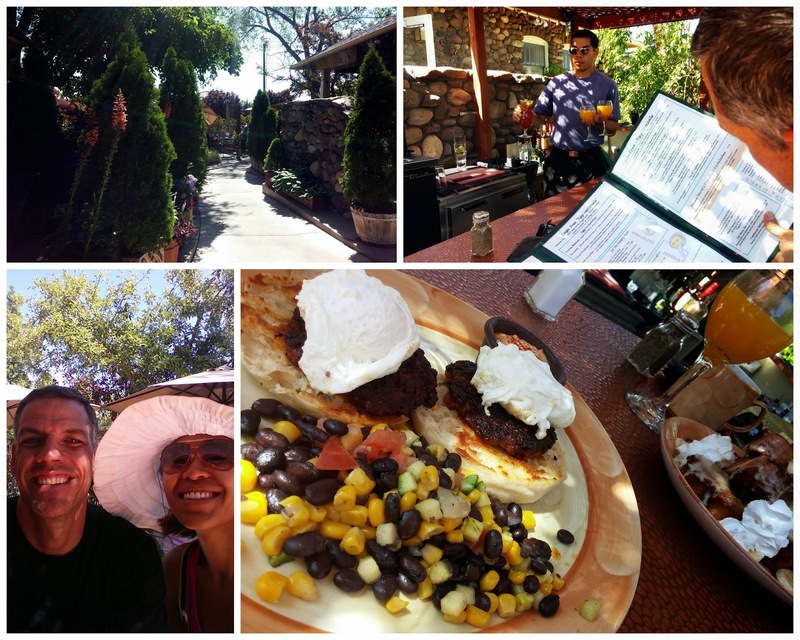 So yesterday morning my husband and I rode to brunch at the Stonehouse. The restaurant has a HUGE patio area that wraps from the front of the restaurant to the side. You feel like you are in a private garden because you're surrounded by tall hedges, lush shrubs and flowering plants. On this particular morning, the bar on the patio had just opened up for the spring/summer season so that's where we took a seat. It was a GORGEOUS morning and the food could not have been any better. John ordered the Banana Rum French Toast which was three slices of Ciabatta bread dredged through Stone House batter and topped with caramelized bananas, a banana rum sauce, whip cream and toasted pecans. I picked one of the staffs' favorites--the Chorizo Eggs Benedict with Chipotle hollandaise sauce on the side. It was OH SO DELICIOUS and spicy!! 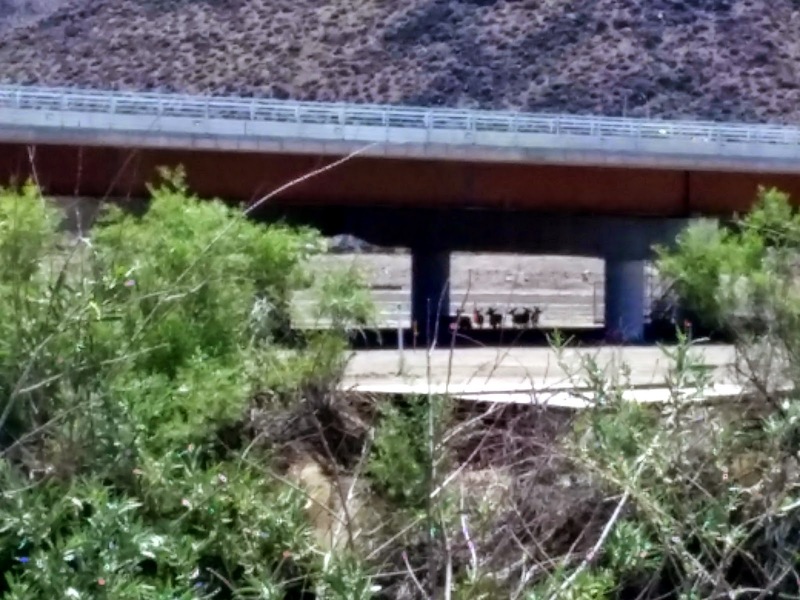 We took the Truckee Meadows River path trail eastward until it stopped at the Southeast Connector construction site and spotted some deer seeking shade from the afternoon sun. 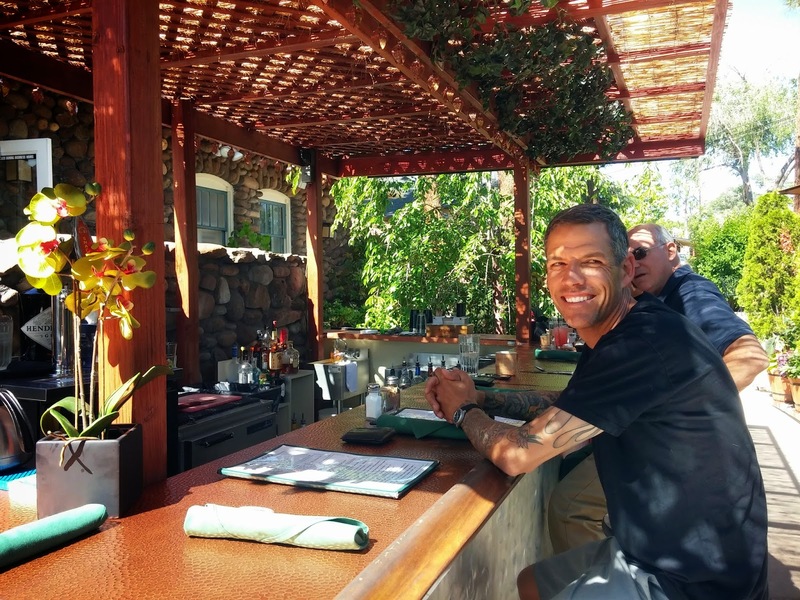 It was a nice 30-mile roundtrip ride (longer than usual because the first restaurant we stopped at didn't work out) so we were happy to find something new at a familiar place. Spinning on the bike was good for me because my legs were so, so sore from running in the Reno-Tahoe Odyssey Running Relay Race on Friday and Saturday. I hope you had a great weekend!! I would love to hear about where you rode your bike and what you did.